Nokia today announced its debut in ‘Touch and Type’ design with the launch of two new stylish 3G enabled Mobile Phones, Nokia X3 – 02 and Nokia C3 – 01 in Indian market for Rs.8839 and Rs.9389 respectively. Nokia’s both latest ‘Touch and Type’ devices combining keypad functionality with a sleek touch screen interface. The new Nokia X3 – 02 and Nokia C3 – 01 Touch and Type are perfect examples of bringing new consumer value by giving users a larger touch screen with clear icons and menu and a familiar keypad keeping critical keys such as the send and end keys. 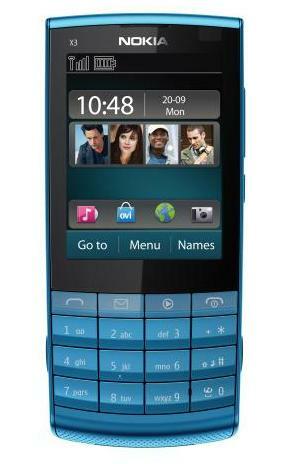 The 3G enabled Nokia X3-02 Touch & Type mobile phone is unique combination of touch screen and traditional 12-button keypad is offered by super slim mobile. It contains 5-mega-pixel camera, TFT resistive touch-screen, Bluetooth, WiFi b/g/n, standard Li-Ion (BL-4S) battery, FM radio, a microUSB port, and Nokia charging port etc. Nokia X3-02 mobile is available in different colors such as white, dark metal, silver, petrol blue, pink, and lilac. To tune in to FM radio, users need to tap the radio icon on home screen. New tracks can be founded at Ovi Music. Nokia C3-01 is among the smallest Nokia touch devices with enhanced usability and is designed for people who want their intuitive and familiar Series 40 UI experience, enriched with touch. C3-01 is an 11mm-thin stainless steel candybar that comes with a 2.4 inch QVGA display, and a standard alphanumeric keyboard just below it. The device has 3G, Wi-Fi, 3.5mm headset jack, FM radio, stereo Bluetooth, Facebook and Twitter integration, Nokia Messaging, 5MP camera with flash, and MicroSD card support. any way now quality of NOKIA is a BIG ???? ?